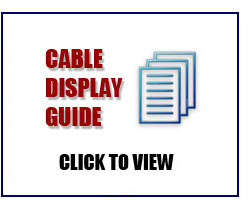 Our poster Holder cable display kits make choosing your cable display simple. They include all the cable components you need. Just choose the configuration you like and the poster size to be displayed and your done. You will have cable display Poster Holder Kits in the windows of shops, Estate Agents, travel agents or even in museums where they are popular as photographic displays. This cost effective versatile method of displaying posters easily comprises of a system of vertical wires attached to the floor, ceiling or wall then clear acrylic poster holders are clamped onto the wires. The cable display systems takes posters in A4, A3, A2, A1 sizes. If you. If you don't see the kit you want you can build your own.